I typically wear black and white, however, this citron yellow/green is one of my favorite accent colors. I love all these new arrivals at Banana Republic. I have on my eye on this chunky turtleneck sweater (I can't decide between the gray or the green - plus it comes in a lot of other colors) and this fur trimmed plaid jacket. Those plaid pumps are perfect! 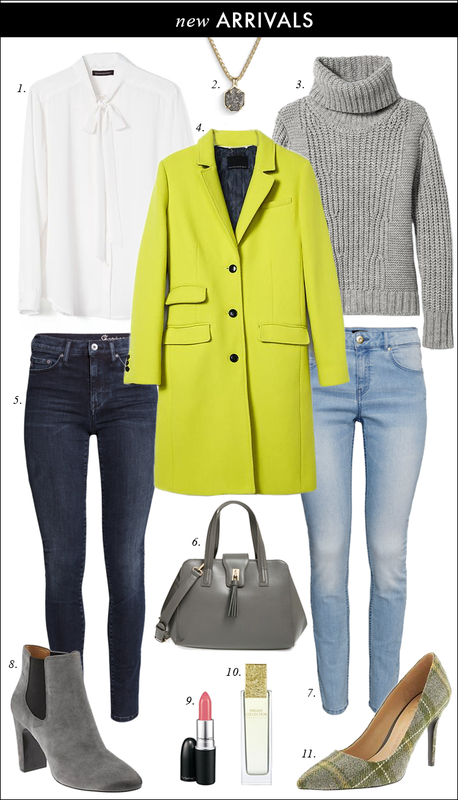 Citron green Three-Button Tailored Coat is an absolutely amazing eye candy! Lovely outfit! Every closet needs a gray turtleneck sweater for fall! Great picks!! I didn't think I would love that coat as much as I do, the color is so unique! Oh my goodness, that green goat is AMAZING. I'm loving the bright coat and cozy sweater! Great picks, you have impeccable taste Lisa! I always enjoy the collages you put together, have a great weekend. I love both of these outfits! The plaid pumps tied with the bright jacket is so much fun!! In love with those gray booties for number 8!! !